I picked up four squash blossoms ($2) at the Penn Quarter FreshFarm Market last week, stuffed them with mozzarella from Blue Ridge Dairy, dredged them in egg, flour and a little cornmeal, and fried 'em. I've also spotted some at the 14th and U market. 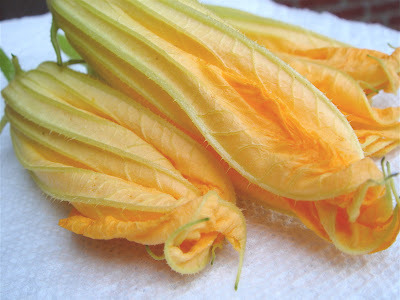 What's your favorite way to prepare squash blossoms? Last week I made Oyamel's goat cheese stuffed blossoms, and this weekend I stuffed them with Blue Ridge's ricotta, prosciutto and oregano and fried them in cornmeal. I'm in love with squash blossoms. Same here. Cornmeal in the batter is a must...and I like to add a bit of white wine for acidity and brightness. For stuffing, I use formage blanc and a bit of thai basil. In the veggie doldrums of summer, blossoms are a great find. Anyone do anything with blossoms besides stuffing and frying them? I love cheese-stuffed fried blossoms, but I'd like to find something else to do with them? Also, Josh, veggie doldrums? Are you teasing? It's feeling more like veggie nirvana to me this time of year. foodietots - the Oyamel recipe looks delicious. Did you happen to score the recipe for the squash blossom soup they were serving that day at the market? food rockz man - I would absolutely make Oyamel's squash blossom soup if I had been smart enough to grab the recipe at the market. A nice break from the stuffed and fried. The flavor was really nice. I was at the Source last week and they served theirs stuffed with foie gras. It was decadence. 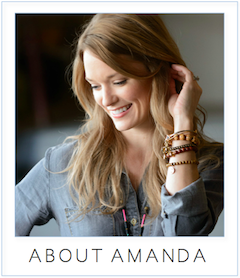 Amanda - I did get the soup recipe. Will email it to you. Food Rockz Man - At Mio a few months ago, we had some stuffed with baccala, then fried. The Oyamel recipe calls for baking instead of frying, which really lets you get the pure flavor of the blossom. Plus it's much lighter that way. But as for a different route--on Sunday I had squash blossoms in scrambled eggs and cream cheese at the Tabard Inn. quite tasty and a pleasant divergence form the usual fried style. I have stuffed them with fresh ricotta and pine nuts. My fruit guy said he stuffs them with rice.